Haha, they're the worst kind. You never know when they'll jump onto ya. Jumping spiders are my second favorite spider. I love the flourescent green markings that are supposed to look like big fangs. Most people don't look quite that close. What was your ref, was one sitting nearby? I found this on google images..don't ask me why I went looking for one. This one creeped me out almost as much as that black widow I did a while back. Ah, I love jumping spiders! Me and my friend used to look for them then fight over who got to keep it. These little guys are all over my house right now. And there always seems to be one that lives on the window sill and ceiling of my office. Just tell me they're not poisonous. Well done illustration, Dave. Those hairy little legs! What's that white area on the top of him? I keep getting the feeling he's about to jump. eeek! That's great Dave...well done broski. I forgot how good you were, thanks for the reminder. That's just sick! Excellently drawn .. but sick. eeeww, indeed. bleck. I don't know how you could have looked at a picture of a spider long enough to draw this. But, tis very well drawn. For a spider. I think his name should be Mr. Squish. Yea... I was thinking something along the lines of Mr. Squish..or George Splat..or like that. OH, I just wanted to do a spidersketch on thursday, and gave up when realized I don't know how spiders look like. I heard the know how to get out of their cages at night and lay eggs in people's ears. ((heheheh lol) You have a lot of animals Joy! This guy is creepy looking but the live ones are very very tiny...not at all like a tarantula. Poppa: tiny spiders scare me hehe the smaller they are, the scarier they are...big bugs i like, so this guy would probably make me faint! shaving cream, anyone? lol nah I love teh fuzzies on this. cool. gr8 job!!!!!!!!!!!!!! Myself personally I like spiders, if not for spidres and bats the mosquito problem up here would be intolerable. And their webs are pretty. I used to be arachnaphobic, but I had to get over that because while hunting there's alllll kinds of spiders waiting in the woods, especially before daylight and after dark. I still don't like them much, but I can tolerate them. Actually this kind of spider... 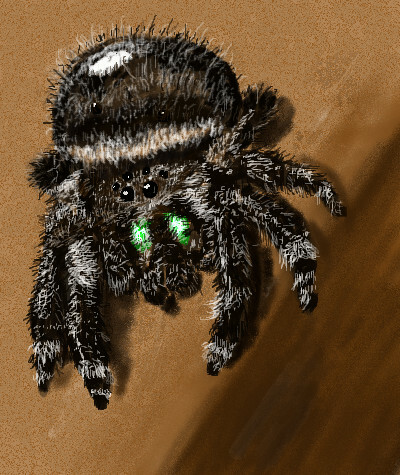 I call it the typical fuzzy black house spider with pretty green eyes. I think they are kinda cute. There was one in this room for about a week that walked across the ceiling every night and "hung out" by the light fixture above me. We got along pretty well until she decided to climb down the bed canopy sheers onto my pillow, and then I decided she wasn't cute and , well... there went the deadly boot. Spppplat. No more pet spider. You really did a great job of capturing the creepy cuteness they have. i do believe that pound for pound, and body to brain size, jumping spiders are the "smartest" creatures on the planet. i remember seeing it on the discovery, i have a photo of a green one i hope to do soon! :� spidery grossness...I just found this thingy...great draw! I am glad he is on the screen not here with me.